This fantastic brand new machine, with its striking retro artwork, is packed with 60 Arcade classics, such as Pac-Man, Galaga, Frogger and Space Invaders. 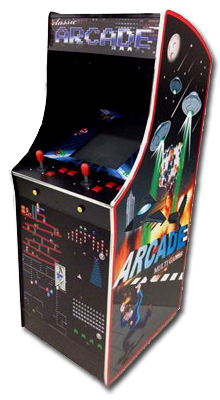 This machine has always been one of our bestsellers, and the 2013 version has several improvements to make it the ultimate Arcade cabinet. The LCD screen now features a better viewing angle and an option to change the display from vertical to horizontal. This makes is ideal for use with the Game King 2100 in 1. Other improvements are the 6 buttons per joystick (the old model only had 3) and laminated artwork, which gives the machine an even more striking appearance. NEW! The latest version of this cabinet is now equipped with original Sanwa joysticks and better buttons. Not only are these more reliable, but also offer better response times. The complete list of games (PDF). Please contact us for more information and ordering the new JAMMA Arcade 60 in 1.